So in the last two weeks (of typing this), a kayaker was found drowned in Haulover Canal on the northern end of the Space Center and a British family was killed while attempting to maneuver through the crowds queued up to watch a SpaceX Falcon rocket on the way to the International Space Station. Safety is a serious subject. To be honest, I sort of cringe at the subject of safety because it is far too often over emphasized. 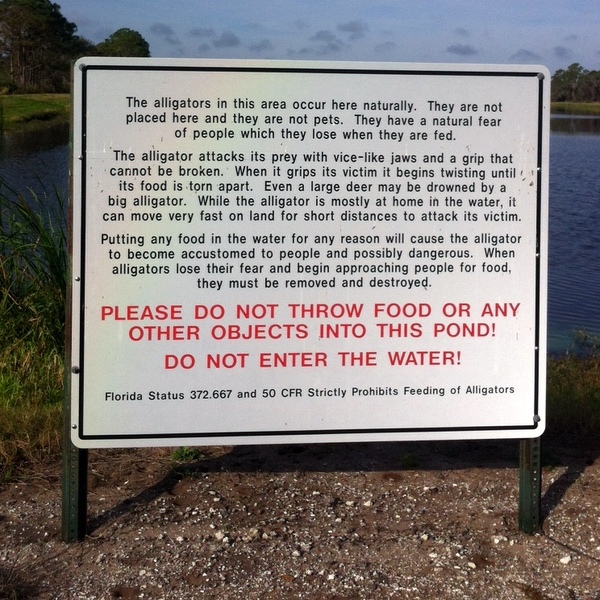 Below is a random selection of safety advice---Paddling on the water around the space center, and some advice while "in" the water or even getting to the water---or to view an inspiring rocket launch. 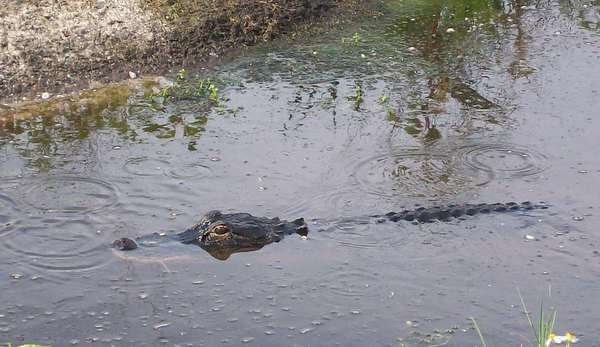 Well of all the safety factors, alligators get the most attention- because of the biggest teeth? The threat is overrated- if you view attacks from a purely statistics. Still it never hurts to be cautious. 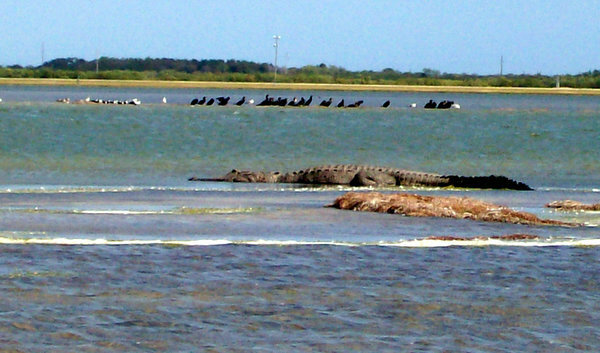 American Alligator, a common sight on the Space Coast. They are not hunted in the protected waters of the space center and grow old and big. Little too much warning, but some folks push the limits! Please stay away and do not feed! And not enough focus on a more common problem: Stingrays! ALWAYS shuffle your feet (the sting ray shuffle) when walking or wading in the Indian & Banana Rivers, Mosquito Lagoon and their fresh water tributaries. The sting rays are there, they are scared of you and they will flee. Just shuffle your feet and they will scoot-You will never even see them. 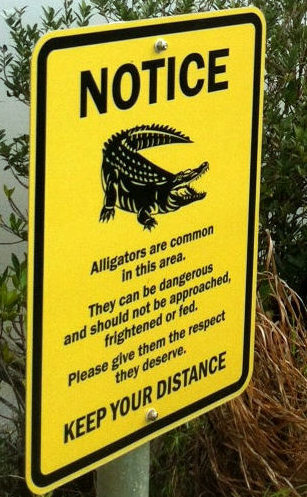 But step on one and the barbed stinger in their tail will ruin your vacation. 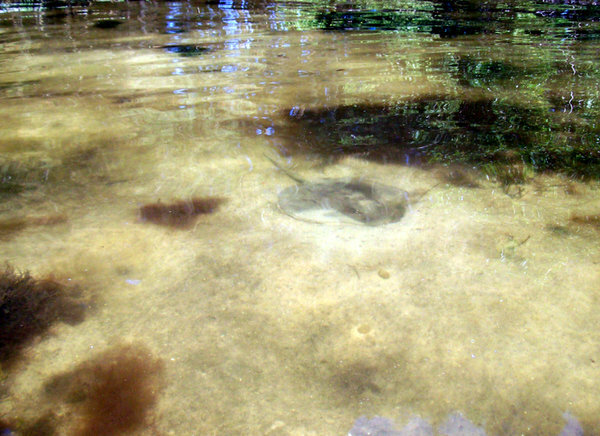 In the photo a ray waits for mud minnows to ambush. However, I have observed that one percent of sting rays that will sit in their sandy depression when you walk up to them and I had to nudge them away. And so because of that one percent of rays that will not flee, you must always shuffle your feet in these waters. A very painful wound results in a sting by the barbed tail of this shy fish. Make the sting ray shuffle (drag or shuffle your feet) part of any time spent in salt or brackish waters. Central Florida is one of the so called Lightning Capitals of the world. 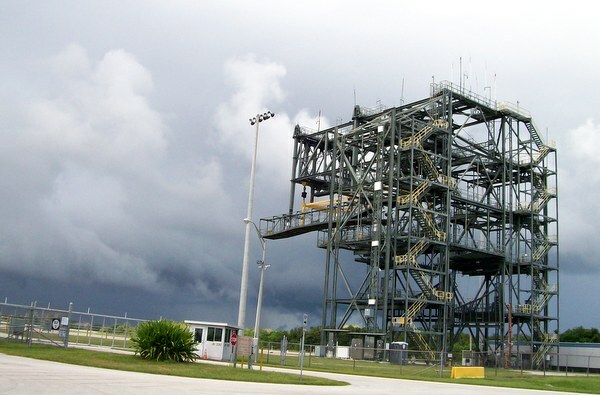 Kennedy Space Center has rules that all outside work will cease when lightning is within 5 miles. What if you are out on the lagoon or river? This summer storm on the distant shore is a perfect example of (---add cuss words) This little cloud changed quickly into a big dark monster that caught us before we could get off of the water. Bringing scary lightning, rain and a serious change in wind directions. Nowadays you can monitor your cell phone for the weather change, but always have an 'escape' plan to get off of the water in a lightning storm. Pine Island on the Indian River is often my "get off the water" lightning escape location. Insect repellent is kept in the boat just for those times when I have to get off the water & into 'real' Florida. Use of the Personal Floatation Device when on the water. Forget for the moment, that having one your boat is the law and it is never put on. 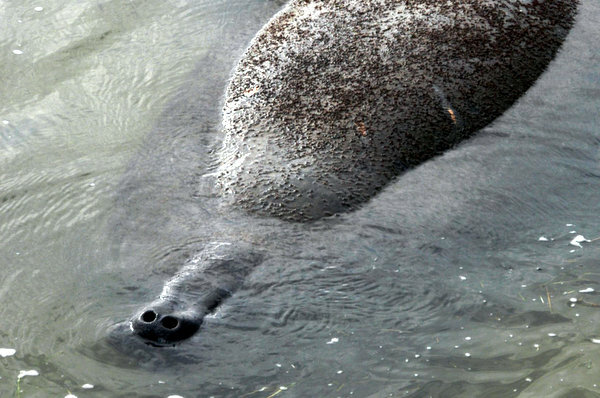 The Space Center "No Motor Zone" was set aside for Manatee habitat and has the largest concentration of manatees outside of winter springs or power plant hot water. And so these cute, large herbivores will flip your boat in an instant if you scare them. Often they will be sleeping as you paddle over them.....and "splash"--- that fast you and your lunch are wet in astonishing big splashes of water. 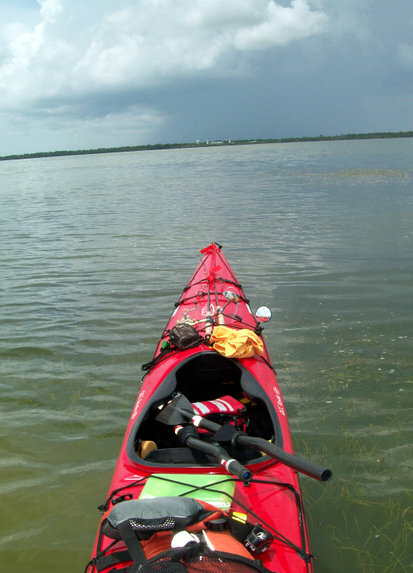 It is not uncommon for a kayaker to be tossed from their boat in a manatee rodeo! Beware startling the gentle giants of the Space Center! The NASA Causeway page has the story of my wife being flipped from her kayak. The point of this photo? Wear your PFD at all times when on the water! In an instant, you paddle over a sleeping manatee and the world will turn white with spray, waves and foam as these endangered mammals use their huge tail flukes to escape from you in manatee panic. PFD. PFD. Life Jacket. PFD. Use it, love it. About the paddler who just died at Haulover Canal (the canal that connects Mosquito Lagoon and the Indian River. 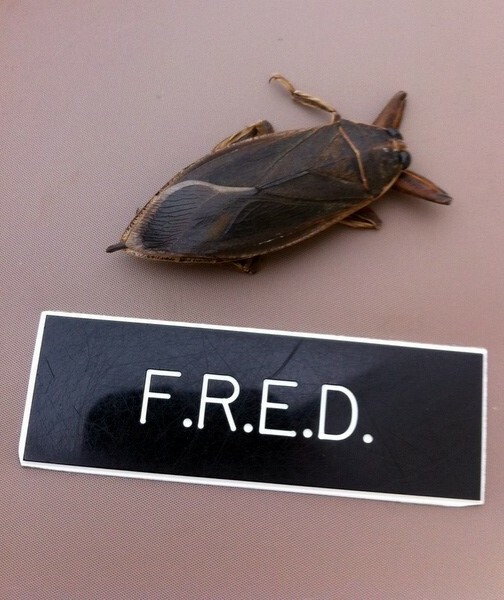 I do not know if he was wearing his PFD, however they did not find him right away. So I suspect he was not. 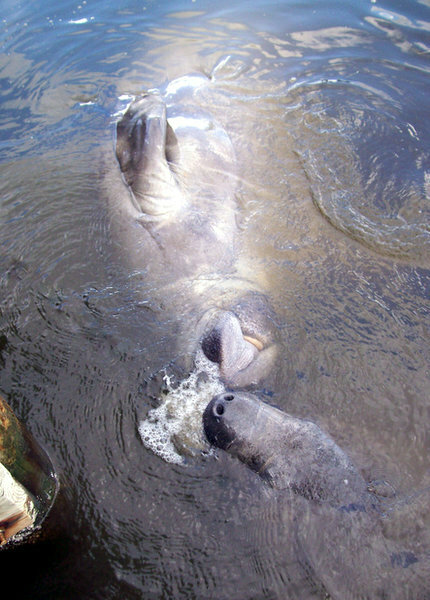 I also know that Barris Cove at the Haulover launch is saturated with happy-happy mating manatees and manatee families drinking at the fresh water seep under the manatee observation deck. Another subject to consider. A paddle partner. The above mentioned paddler was last seen paddling by himself. Full discloser: I am guilty of this nearly every time on the water. I am a solo paddler, night and day paddling 20 miles at a time when training for the MR340 kayak/canoe race. I have attended many kayak meetups, events and races, but go solo most often because most people want to put in three miles and take a break. Then three more before heading to a brewery. My PFD "Life Jacket" is on at all times on the water and I consider myself a strong swimmer. The point is the PFD is for when the unexpected happens. However I do understand, acknowledge that a paddling partner is nearly as important as a PFD. And speaking of PFDs! 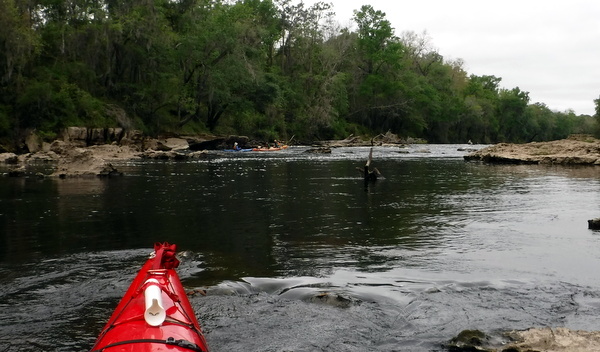 I just returned from a four day paddle on the Suwannee River. At one of the exposed shoals, another kayaker was tipped over by the rocks. She was wearing an inflatable PFD in which she had removed the automatic water sensor that inflates the Life Jacket when immersed in water. Consequently as she struggled in the rapids to retain her paddle, boat, composure, she was also attempting to manually inflate her PFD. Life Jackets are for those unexpected emergencies. In some events you will not be conscious to "puff up your PFD" with salvaged breaths of air. And I was going to opine on rocket viewing....Let me apologize for being long winded on the PFD subject. Sometimes I can obtain a car placard to watch the upcoming launches. In the extreme, unlikely event of an anomaly, the Emergency Operations Center will give directions over the KSC Paging and Area Warning System. Sure this is a possible problem -I have witnessed two Atlas rockets blow up. However the real danger is Traffic before, during and after the rocket launches. People are lost, they may be tired or suffering from heat related problems. They may be drunk-as I noticed on my MR340 practice paddle to watch the last night shuttle launch. The flying swimming Giant Water Beetle. I think they hit the VAB at night while flying. Because in the summer (wet) months they are piled up at the base of the VAB......Don't know why. 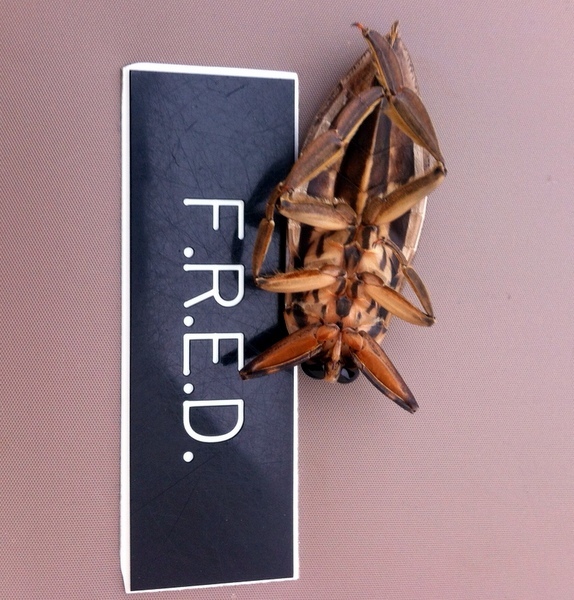 --Do know that as kid I tried to and succeeded in catching a Giant Water Beetle--predators extraordinaire. Yes well I screamed for a long time. Ok, so 99% of all snakes in Florida are completely harmless. Reminder: You are in their home. 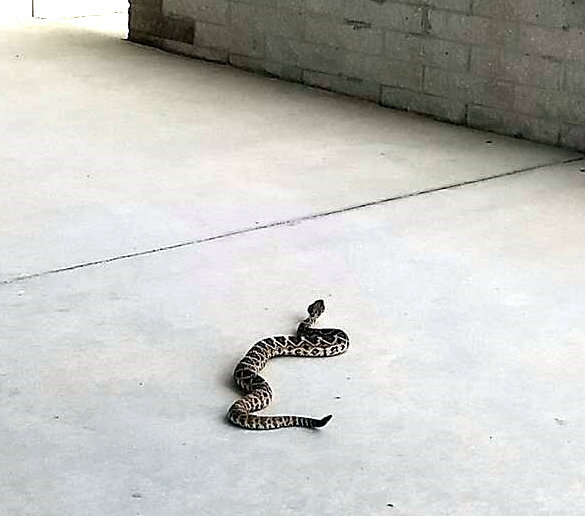 The Space Center is a wildlife refuge and Eastern Diamondback Rattlesnakes are a protected species. (Photo credit: NASA) Picture taken at the entrance to the Space Station Processing Building. Well no..... 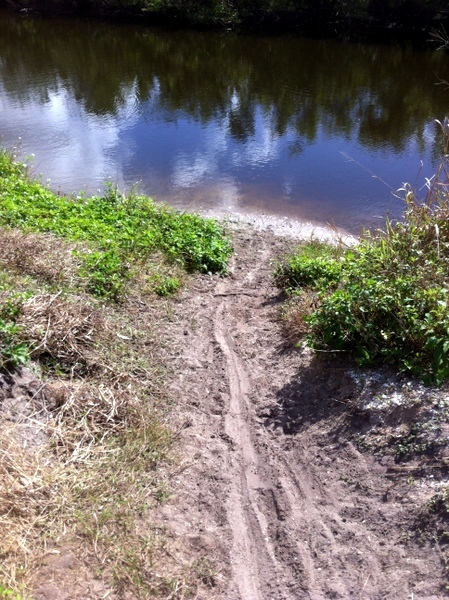 This is the drag marks of a big alligator scooting into a canal. Remember---you are a vistior in their home. Return home from Indian River Lagoon Safety.